If you’ve got people coming over this weekend the last thing you want to do is worry about mixing them drinks all night. And if you want to serve something a little nicer than just a few six-packs we have two words for you: Make Ahead. You can put together these drinks in large quantities anywhere from an hour to an entire day before your party, freeing you up to do what you really want to when guests arrive: drink. Apples, peach, St-Germain—this gin-and-tonic based punch packs wonderfully complex flavors. You can get this bourbon, grapefruit and raspberry cocktail mixed up in advance so you have plenty of time to get ready for your Tom-Cruise-in-Scary-Masks themed party. Cinnamon, ginger and cloves will make this different than every other margarita you’ve had. If you haven’t started infusing your own spirits yet, the Figa is cocktail get you started. Prep some fig infused vodka for it a couple days before you plan to start drinking. The World Cup is over, but you should have developed a taste for cachaça by now. A fresh take on the fruity, classic Singapore Sling. This one is for a crowd who wants something sweet. Bobby Flay’s summer cocktail takes a little more effort up front—you have to blend and strain the watermelon, but it’s worth it. 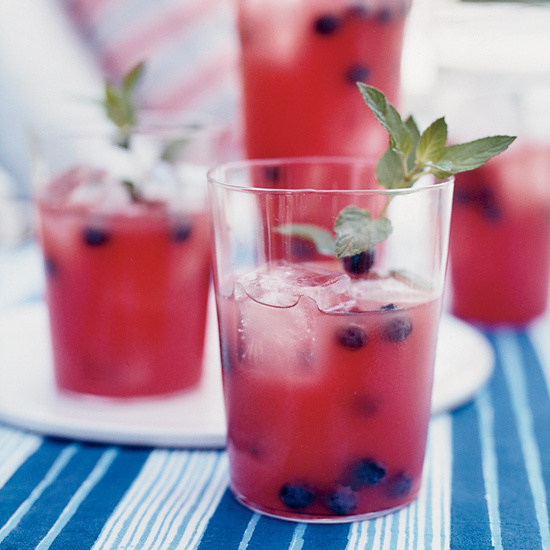 This is a boozy summer afternoon in a glass.